Kepco's Series MTW are three affordable PC card-style RoHS (Reduction of Hazardous Substances) compliant, lead-free power supplies that offer 15, 30 and 60 watts of triple-output low voltage d-c for space and cost-sensitive OEMs. All three models produce triple outputs comprised of 5 volts and ±12 volts d-c from an a-c input that accepts 85 - 265V a-c. They will also accept a d-c input from 110 - 370V d-c. The 5V output is isolated from the ±12V outputs. The MTW Series meets the requirements of FCC Class B, VCCI-B, EN55011-B and EN55022-B for conducted emissions and EN61000-4-2, -3, -4, -5, -6, -8 and -11 for emission immunity. The 15W unit measures 1.02"H x 1.97"W x 5"L (26mm x 50mm x 127mm). The 30W unit measures 1.02"H x 2.56"W x 5.51"L (26mm x 65mm x 140mm). The 60W unit measures 1.02"H x 3.27"W x 7.28"L (26mm x 83mm x 185mm). The MTW meet UL 60950-1.c-UL and TÜV Rheinland EN60950-1 (ambient temp. 50°C max. ), and meet creepage and clearance requirements of DENAN Appendix 8 (at 100V a-c only). MTW are ideal for cost-sensitive OEM applications that require a small multiple-output RoHS compliant power supply with all international EMI and safety certifications. Optional cable kits are available which contains two cables, one for input, one for output, that are terminated on one end with the mating connectors to the MTW input and output connectors, and unterminated on the other end. Each cable is 1 meter long. Optional covers are also available. 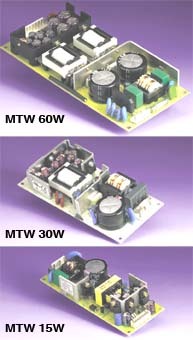 MTW are CE Marked per the Low Voltage Directive (LVD), EN60950.